What is the motivation behind the project? 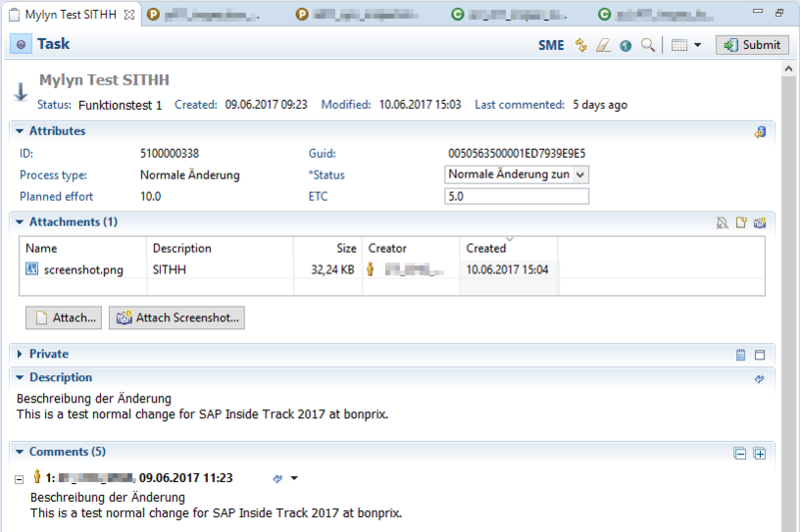 We are using SAP’s Change and Request Management to plan and roll out our releases. The “problem” with ChaRM is that you need to use the Web-Ui to organize your documents. I am developing in Eclipse using the ABAP Development Tools (ADT), but I need to constantly switch between Eclipse and ChaRM’s Web-Ui in order to maintain my change documents. So I worked out a solution to integrate our change documents from ChaRM into Eclipse by developing a Mylyn connector. 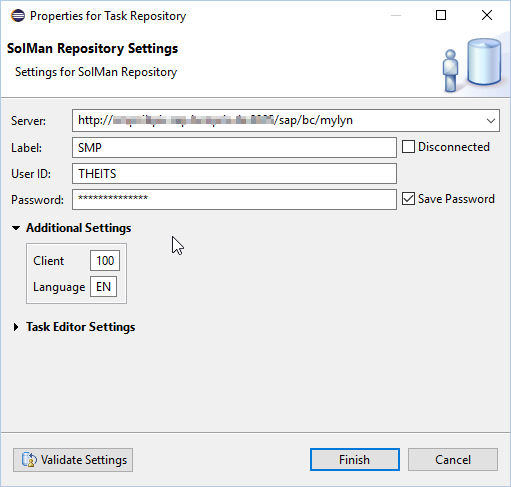 Mylyn is an application lifecycle management framework for Eclipse. It offers an task focused user interface, which allows you to organize your workload without leaving you development environment. 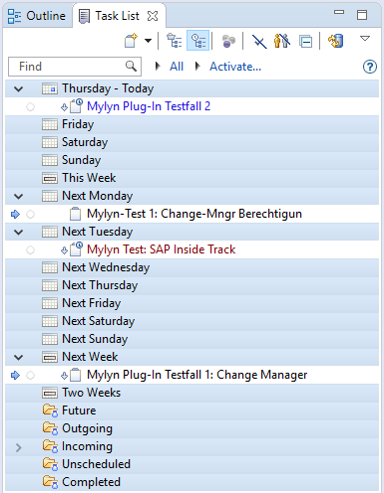 Since Eclipse became the state of the art development IDE for ABAP development, I came up with the idea to develop a plug-in for eclipse which allows you to connect to your SAP Solution Manager in order to integrate your ChaRM documents into mylyn. How is the connector integrated in our process? The requirement of changes and the related change documents are still created via ChaRM’s Web-Ui. 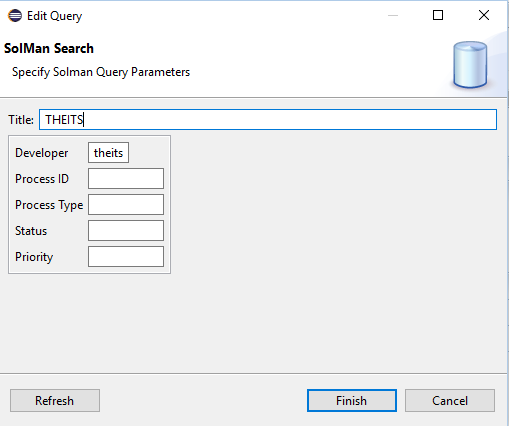 After the change document is assigned to a developer, you are able to fetch it with Mylyn by defining a corresponding query. What does Mylyn look like? You can add your Solution Manager as a repository in mylyn. This is a lightweight searching mask to fetch the change-documents from ChaRM which are assigned to you. On the view you can see all relevant information about a task. Mylyn allows you to schedule your tasks, to keep an overview of your workload for the next weeks. The defined dates are only local and will not be synchronized with your repository. Mylyn allows you to link your tasks with your development objects. So when you activate a task in Mylyn all linked development objects will be opened in Eclipse, which avoids searching for your artifacts manually. This feature is called context in Mylyn. It is planned to release the Eclipse Plug-In and the REST-API with an Open Source License, so that everyone who is interested in using the Plug-In can do so or contribute to the project. I hope you will release this soon. on which Version of SolMan is this developed? sorry for responding that late. The software was developed on SolMan 7.1. If you find a bug or have further requests please report it in github.